The touchscreen on your smartphone is not enough. You need at least... three more touch-and-pressure-sensitive areas to be able to fully interact with your device! That's the premise behind Sensus, an iPhone case that enhances apps and extends the user interface onto the sides and back of your phone with rubbery touch strips. While this may sound confusing, it looks quite simple--or at least it did on the pre-production model I saw at CES ShowStoppers on Tuesday. The Sensus is about the size of a basic iPhone case: Slim, made of polycarbonate plastic, with rounded corners and a bottom that extends about a half-inch beyond the iPhone's lower-most edge. (The case is powered by your phone and plugs into the lightning jack). The sides have rubbery strips of touch/pressure sensitive material, while the back has an entire swatch of the stuff. The pre-production model was all black, but we may see a variety of colors and patterns when the case debuts this summer. Canopy, the Minneapolis-based tech company behind Sensus, showed off a similar case at last year's CES--one that was touch-only, able to record swipes, slides, and taps on the sides and back of the phone. The new case has resistive as well as capacitive sensors, so it can not only tell when you're touching the case, but also how hard you're touching the case. A representative demoed this pressure-sensitive feature with an app that responded based on how hard I squeezed the sides of the case. The touch pads are highly sensitive and appear to be accurate, but the pressure feature made my hand hurt. Perhaps that was because all the apps Canopy used to demo this feature required squeezing and pressing as hard as possible. Anyway, what's the point? Canopy explains that Sensus lets you extend your phone's user interface across the sides and back of your phone, perfect for people who like to keep their touchscreens fingerprint-free. The most obvious use for Sensus is games--think racing games, adventure games, and basically any game that requires as much screen real estate as possible. In a racing game, for example, Sensus' pressure sensitive feature might let people use pressure to control speed. In an adventure game with a virtual d-pad, Sensus' back touch pad might let people move about without obscuring the screen with their thumbs. Other uses for Sensus include apps that require scrolling, such as social media apps or webpages. Imagine swiping the side of your phone to scroll through your Twitter feed instead of dragging the screen with your finger. Sensus might also be useful for any pinch-to-zoom apps, such as mapping or photo apps. According to Canopy, Sensus already works with hundreds of apps on the market. The company is working with developers--and has an SDK publicly available--to get even more apps on board. A demo of the main Sensus app, which will help users find Sensus-compatible apps online and on their phone, showed several popular apps, including Evernote and Cut the Rope. Sensus will launch this summer for iPhone 5 and 5S and cost around $100. 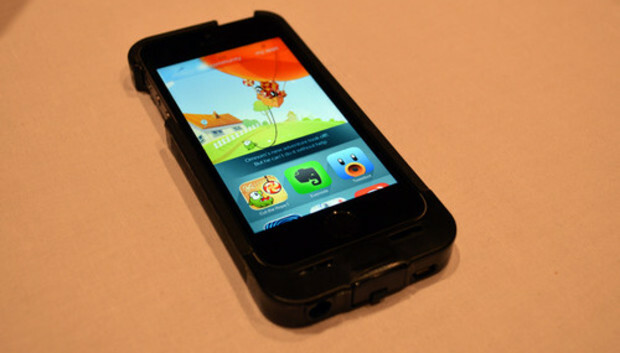 Canopy hopes to have select Android versions of the smart touch-case available by the end of the year.